Most of the ride, Jason was hanging out behind us with Matt from Dahon until we had some betel nut. 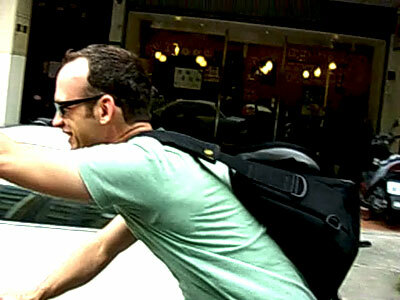 Then he was all sprinting from stop lights, taking pulls, dropping us, mister energized on the bike – watch the video. Then I climbed a hill like never before on a folding bike, while I heard Once in a Lifetime in my head. I expect my legs to really hurt tomorrow. Betel nut is a chewable stimulant sold in stands, similar to cocoa leaf, and it’s dispensed by girls in lingerie. A betel nut sports drink would make Red Bull seem like kool-aid. It also turns your mouth red, sort of like the spice in Dune, and is part of the Taipei experience. If we get tired blogging at the IDF, I know where that stand is. More Blogging Taipei photos in our photostream … and Matt’s photo gallery. Podcasts tomorrow.